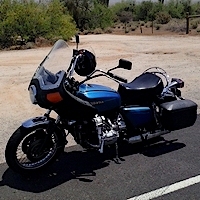 Motorcycle: 2000 1500 SE, XR 650, CBR 600, Harley FB, KLR 650, CBX 750 Cafe Racer, Z1000 Eddie Lawson. I was visiting a friend who could not find her cordless phone. After several minutes of searching, her young daughter spoke up. A man finds a lamp. He rubs it and a Genie emerges. The Genie tells him he will be granted three wishes. The man thinks for a moment and says, "First, give me a bottomless mug of beer." A mug of beer appears in his hand. He sips it once, then again and the mug is magically refilled. The man is thrilled and continues to drink. The mug never empties. Then the Genie says, "And what about your other two wishes?" The guy thinks for a moment and says, "Give me two more just like this one!" There's An App for Everything! I went into my local wireless store looking for a solution to a problem. "I have a horse that I can't seem to get going when I mount him," I told the customer service representative. "Nellie won't listen to my commands, and when she does start moving, it's just a slow, lazy trot." "I have just what you need for your phone," the rep replied. "The latest version of the "Giddy-App!" And thus began Bobs life of celibacy.